An exit device model from Von Duprin. Through its comprehensive portfolio of door hardware, and mechanical and plumbing and architectural products, Riyadh-based UBM caters to the stringent requirements of the hospital segment. In line with its tradition of sourcing the best products and materials for the construction industry from around the world, Universal Building Materials Merchants (UBM) of Saudi Arabia has enhanced its offering of door hardware, mechanical and architectural products for the hospital segment. The Riyadh-based company works closely with designers and architects to fulfil their architectural aspirations and has partnered with some of the world’s leading manufacturers to introduce the widest choice of healthcare products available under one roof in Saudi Arabia. “Today’s healthcare facilities are evaluated not only for their ability to provide cutting-edge medical treatment, but also by how peaceful they can make the environment for patient welfare. This can be a challenge because, by nature, hospitals are busy places with constant activity and noise,” says Sandeep Bindal, chief executive officer of UBM. Not surprisingly, noise often tops the list of patient complaints during a hospital stay, he says, adding long hallways and flat surfaces provide perfect conditions for echoing. “In fact, some studies have shown that noise levels in hospitals can rise to over 100 dB. To put that into perspective, that’s about the same level of noise as a typical motorcycle,” he elaborates. This level of environmental noise can exacerbate stress, anxiety and aggravation among patients — not to mention caregivers and visitors. As a result, more hospitals are seeking ways to reduce noise and give a clean, hygienic environment that is easy to clean and maintain. An architect can implement several key design elements to provide a quieter healing environment and reduce transfer of bacteria, increase restroom hygiene, and limit excessive water usage, whether he’s designing a new healthcare facility or renovating an existing one. These include door hardware, mechanical and plumbing, and architectural solutions. 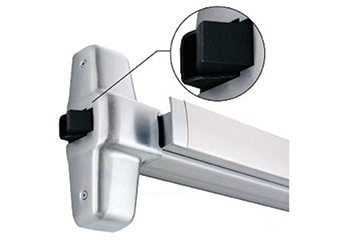 • Quiet electric latch (QEL): Powered by a motor-driven latch retraction, the QEL provides a much quieter solution than traditional exit devices. Because it also requires less power than other electric latch products, it can be wired up to 800 ft when 12 gauge wire is used. This feature is available on all Von Duprin 98/99, 33A/35A, and 94/95 Series exit devices. • Concealed vertical cable system (CVC): The CVC system from Von Duprin is a quieter solution over traditional surface and concealed rods. The enclosed cables do not lift up or down like traditional rods – they operate quietly within the door. • Pneumatic-controlled exit device: This pneumatic solution provides efficient latch retraction using compressed air. It is available on non-electrified panic and fire exit hardware and as an option on all Von Duprin 98/99 and 33A/35A series exit devices. • Door silencers: Ives, a brand belonging to Allegion of the US, offers heavy-duty rubber door silencers that easily affix to the door frame, acting as a sound absorber that dampens the force generated from closing the door. • Antimicrobial solutions: High traffic, public-use areas are ideally suited to antimicrobial coated door hardware. With hundreds or thousands of people using these areas every day, safety should be top of mind. Adding door hardware with an antimicrobial coating can make a big difference by inhibiting the growth of bacteria on these high-touch surfaces, says Bindal. A valve assembly from Zurn. For mechanical and plumbing solutions, UBM has formed an association with Zurn Industries Engineered Water Solutions, a recognised leader in commercial, municipal, and industrial markets. “Zurn is committed to providing high quality engineered product solutions for healthcare facilities. Our design solutions assist in increasing hygiene and reducing bacteria transfer,” says a spokesman from Zurn. Zurn products enable customers to efficiently manage water and energy usage with cost-effective products. The company’s product offering includes items such as specification drainage products, manual and sensor-operated flush valves, radiant heating systems, modular trench drains, backflow preventers, pressure regulators, fire protection systems, and much more. Some of its products include the XL Series Lead-Free faucets, backflow preventers, and fittings that are engineered and built for long-lasting, trouble-free operation. 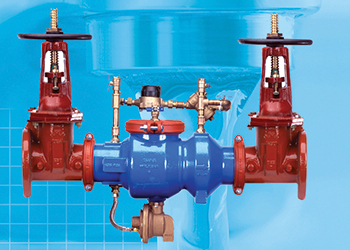 To avoid unnecessary water usage and higher utility cost, UBM offers the Zurn Go Blue diaphragms and filters. “Go Blue replacement parts are designed with superior chemical resistance, resulting in 33 per cent less clogs. An upgrade to Zurn sensor technology reduces bacteria transfer, increases restroom hygiene, and limits excessive water usage. Sensor replacement units, such as the E-Z Flush, provide an opportunity to protect public health while preserving natural resources,” the spokesman says. Zurn’s design solutions focus on water conservation, control, safety, hygiene, and comfort, allowing customers to efficiently manage water and energy usage with cost-effective products. “When you select Zurn Engineered Water Solutions, you get one reliable, recognised manufacturer capable of supplying your entire installation, from rough-in products behind the wall, to finish trim products and fixture systems. Zurn is the one choice to ensure long-lasting, trouble-free installations for new construction and retrofit projects,” the spokesman comments. Also, buildings can be updated with the latest touch-free Zurn products that reduce bacteria transfer and increases hygiene. Silver Shield antimicrobial technology provides a permanent antimicrobial glazed ceramic surface that inhibits the growth of stain and odour-causing bacteria, mould, and mildew. 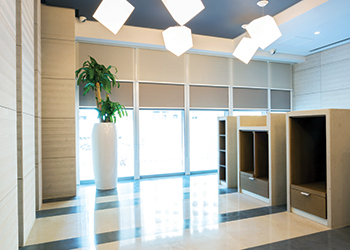 UBM offers a wide range of sun control systems from Hunter Douglas. In terms of architectural solutions, healthcare buildings can be a major design challenge. UBM, along with Hunter Douglas, is working with leading healthcare providers and design teams to create new integrated solutions to meet fast changing needs. “The healthcare sector faces major issues, such as growing demand for care from aging populations, concern over hospital-related infections, increasing pressure to recruit and retain qualified caring staff, tight financial budgets and reduction of operating costs, and environmental legislation which demands energy-efficient buildings,” says Bindal. A world market leader in sun control systems, Hunter Douglas products maximise the healing benefits of natural daylight but keep out excessive heat and light caused by the sun. The European company also provides chilled ceilings that reduce the risk of sick building syndrome (SBS) and offer a clean and energy-efficient alternative to air-conditioning; acoustical ceilings that create a peaceful and calm environment, substantially reducing stressful noise levels; and patented materials that include special treatments to improve the performance of materials in their use, such as anti-bacterial curtains, window coverings or ceilings which help reduce infections. Hunter Douglas’ sun control systems help keep buildings cool. “Hot summers can cause problems in hospitals, nursing facilities and retirement homes. Often buildings have large expanses of glass, which provide unobstructed views for patients or residents but will lead to over-heating when it’s hot. “Keeping the heat of the sun out before it hits the glass, while maintaining good light levels, is what Hunter Douglas’ external sun control systems do best. From sunscreens to sun louvres, there is a comprehensive range, for every type of building, combining performance with design aesthetics,” he says. However, natural daylight is important for the healing process. Outdoors, the sunlight can vary in strength from as much as 100,000 lux to less than 10,000 lux in a matter of minutes. “Inside, we need 100 to 500 lux, depending on what we’re doing – resting or reading. So the quantity of light must be filtered down to the required level – and must be effectively controlled,” he points out. For this, UBM offers Hunter Douglas window covering systems and motorised internal blinds, including the new Luxaflex Variozone Venetian blinds. These allow optimum use of free natural daylight, while cutting glare, Bindal says. Turning to the chilled ceilings offered by Hunter Douglas, he says these systems create a cool atmosphere, with no annoying draughts, almost no convection and, therefore, less risk of sick building syndrome (SBS) or the spread of hospital-based infections. In the healthcare sector, chilled ceilings are a preferred solution, combined with a degree of controlled mechanical or natural ventilation. UBM also offers a range of new ceilings from Hunter Douglas featuring superior acoustical properties made of metal, wood or textiles, with a number of benefits that include noise reduction, better hygiene, easy access for maintenance, and aesthetic value. Hunter Douglas’ extensive portfolio of products also covers curtains with a range of fabrics and materials featuring particular finishes that are especially suited to a healing environment. They offer features such as Dustblock, a dust- and moisture-repellent treatment of fabrics; Sanaplus, an anti-bacterial finish; and Microban, an antimicrobial agent that fends off bacteria and mould. “Microban and Sanaplus offer built-in hygiene protection. Leading independent laboratories have demonstrated the effectiveness of these finishes in the fight against harmful bacteria. Fabrics for window covering, venetian blinds and even ceilings can be treated with these finishes,” says Bindal. Apart from these solutions, UBM also provides Hartmann Tresore safes for the healthcare sector. The European company’s extensive product range includes restricted drugs safes for public pharmacies and hospitals pharmacies and for hospitals, clinics, nursing homes; documents, IT, and media data safes; hazardous substances cabinets; and patients’ room safes and minibars for hospitals. “Restricted drugs safes are available in many different sizes and styles and are ready to be mounted free-standing or into a piece of furniture. If required, the safes can also be equipped with compartment shelves, pull-out shelves and medication drawers. Our product range also includes restricted drugs safes that are compliant with legal requirements and that can be built into modular cabinets,” he says. UBM has contributed to most of the major healthcare projects in Saudi Arabia by being a total solutions provider to the construction industry, right from engineering design to delivery of products and related services. “The company’s leadership position in the building materials market segment is due to the fact that it pools quality products from renowned manufacturers, ensures stock availability, employs highly-trained product specialist and offers excellent after-sales service,” Bindal concludes.